A few years ago I built myself an HF CW QRP transmitter, based upon an LM317T voltage regulator chip!!!. 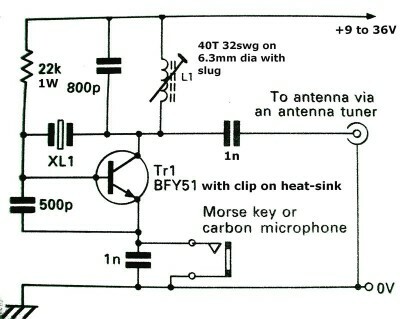 Back in the 70s, I remember my friend Richard G4EIE building a one-transistor transmitter for 160m. It comprised a BFY51 transistor, crystal, L-C tuned circuit, a resistor, a couple more capacitors and a carbon microphone. I will document here my adventures in the Class-E land. For those not familiar with this excellent and easy technique for producing high power extremely efficiently, there is no better introduction than the Class-E RF Power Amplifiers paper, by Nathan O. Sokal, WA1HQC.